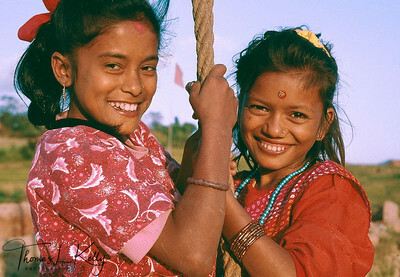 Dasain is THE major festival in Nepal. The ten nights of the Great Goddess. It celebrates the victory of the Great Goddess, Durga over the buffalo-demon, Mahishasur. In a nutshell, this is a celebration of the victory of good over evil, a theme as lasting as any in the convolutions of human consciousness. 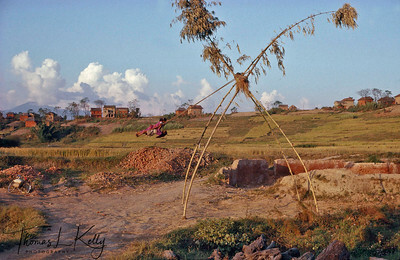 In the villages, in preparation for the festival, and in anticipation of the Goddess' visit, and that of numerous relatives, people ceremonially cleanse their houses, giving them a fresh coat of red mud, cow dung and water. 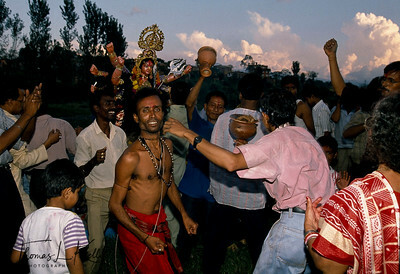 The first day of the Dasain festival, is called Ghatasthapana - 'the Establishment of the Sacred Vessel'. It falls on the new moon day. The next nine days, called Navaratri (the 9 nights of the Goddess), are dedicated to the worship of the nine forms of the Great Goddess Durga. Early morning baths in the river or a stone spout begin the day, while the evenings are dedicated to visiting different Devi temples on each day, and offering worship. Some of the pilgrims carry specially made lanterns. Some offer to lie all night completely still, with burning oil lamps attached to them with cow dung paste. Caste bands play music and masked dancers portraying the nine Goddesses dance on the temple stairs. After about a week, when the sprouts of "The Sacred Vessel", planted on the Ghatasthapana day are grown, the official sacred vessel is carried through the old capital with much fanfare. That day is called Phulpati. It marks to official start of the holiday. All offices and most places of work are closed, and people devote themselves to celebrating the great victory of good over evil. 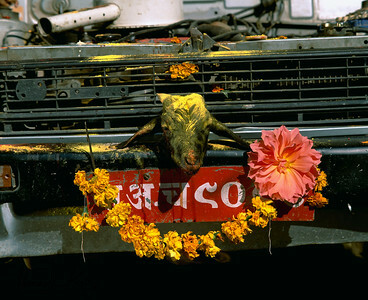 On the ninth day sacrifices are made to Durga for the protection of all vehicles and their occupants, from the luxury limo down to the humble bicycle. On that day the God Vishvakarma, the heavenly handyman and producer of all mechanical things, is also propitiated. 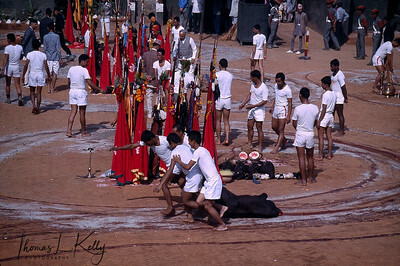 All tools and implements of labor are worshiped with flowers, lights, incense and sacrifice. Students' books, writers desks and pens, doctors' scalpels, all get the treatment. The Marxists even worship their hammers and sickles. Here we see office workers worshipping their computers. The tenth day, Vijaya Dasami (Oct 24), is the day of the Goddess' victory over the buffalo-demon Mahishasur, and of Lord Rama's over Ravana, is the day of receiving Tika from elder relatives and superiors, visiting them in strict order of seniority or rank, starting with one's parents. For the next five days, until full moon day, everybody goes all over the place, visiting relatives, receiving and giving tika, exchanging joyous greetings, and feasting. 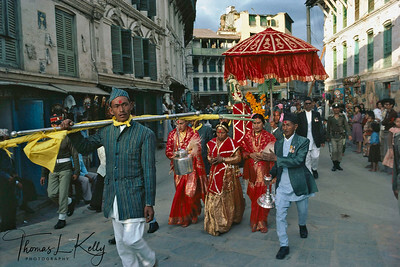 Phulpati Parade. Phulpati means ‘sacred flowers’, denotes the bouquet in Royal Kalash from Gorkha, the original home of current dynasty. 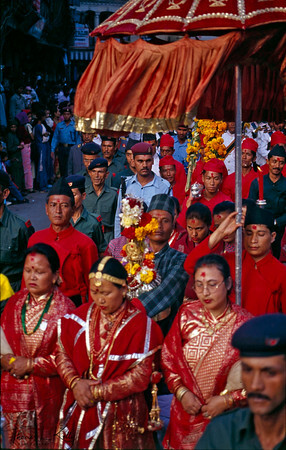 Men of Gorkha carry it for four days to Hanuman Dhoka, Kathmandu. There King receives the phulpati and is installed with guns boom, band striking up the National anthem. 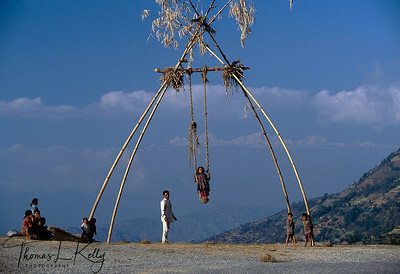 With the great harvest celebration of Dashain, communally made bamboo swings—ping are erected all over the valley. 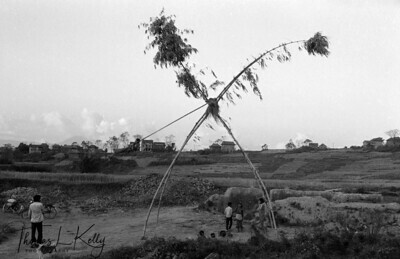 Vijaya Dashami is the day of receiving Tika and Jamara from elder relatives, visiting them in strict order of seniority. 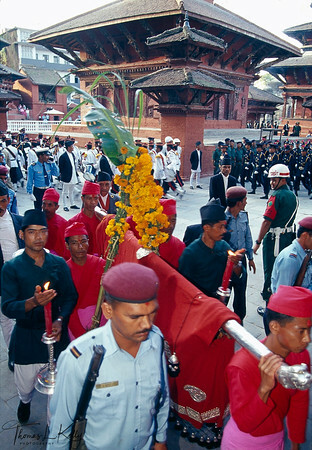 In the mid-afternoon of Dashain, Government people and general public are admitted to the Royal Palace to receive the sacred Tika from Their Majesties the King and Queen. Her Majesty Queen Komal giving tika to general public on Vijaya Dashami.